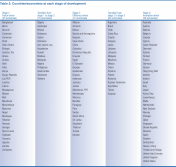 This appendix provides a short description of each pillar of the Global Competitiveness Index 2015–2016 (GCI) and of the application of the concept of stages of development to weight the Index. For a more detailed description and literature review for each pillar, refer to Chapter 1.1 in The Global Competitiveness Report 2014–2015.a The appendix also presents the detailed structure of the GCI and explains how the Index is computed. A healthy workforce is vital to a country’s competitiveness and productivity. Workers who are ill cannot function to their potential and will be less productive. Poor health leads to significant costs to business, as sick workers are often absent or operate at lower levels of efficiency. Investment in the provision of health services is thus critical for clear economic, as well as moral, considerations. In addition to health, this pillar takes into account the quantity and quality of the basic education received by the population, which is increasingly important in today’s economy. Basic education increases the efficiency of each individual worker. The technological readiness pillar measures the agility with which an economy adopts existing technologies to enhance the productivity of its industries, with specific emphasis on its capacity to fully leverage information and communication technologies (ICTs) in daily activities and production processes for increased efficiency and enabling innovation for competitiveness. Whether the technology used has or has not been developed within national borders is irrelevant for its ability to enhance productivity. The central point is that the firms operating in the country need to have access to advanced products and blueprints and the ability to absorb and use them. Among the main sources of foreign technology, FDI often plays a key role, especially for countries at a less advanced stage of technological development. The final pillar of competitiveness focuses on technological innovation. Innovation is particularly important for economies as they approach the frontiers of knowledge, and the possibility of generating more value by merely integrating and adapting exogenous technologies tends to disappear. In these economies, firms must design and develop cutting-edge products and processes to maintain a competitive edge and move toward even higher value-added activities. This progression requires an environment that is conducive to innovative activity and supported by both the public and the private sectors. In particular, it means sufficient investment in research and development (R&D), especially by the private sector; the presence of high-quality scientific research institutions that can generate the basic knowledge needed to build the new technologies; extensive collaboration in research and technological developments between universities and industry; and the protection of intellectual property. In line with well-known economic theory of stages of development, the GCI assumes that, in the first stage, the economy is factor-driven and countries compete based on their factor endowments—primarily unskilled labor and natural resources.b Maintaining competitiveness at this stage of development hinges primarily on well-functioning public and private institutions (1st pillar), a well-developed infrastructure (2nd pillar), a stable macroeconomic environment (3rd pillar), and a healthy workforce that has received at least a basic education (4th pillar). Two criteria are used to allocate countries into stages of development. The first is the level of GDP per capita at market exchange rates. The thresholds used are also reported in Table 1. A second criterion is used to adjust for countries that, based on income, would have moved beyond stage 1, but where prosperity is based on the extraction of resources. This is measured by the share of exports of mineral goods in total exports (goods and services), and assumes that countries with more than 70 percent of their exports made up of mineral products (measured using a five-year average) are to a large extent factor driven.c Countries that are resource driven and significantly wealthier than economies at the technological frontier are classified in the innovation-driven stage.d Any countries falling between two of the three stages are considered to be “in transition.” For these countries, the weights change smoothly as a country develops, reflecting the smooth transition from one stage of development to another. 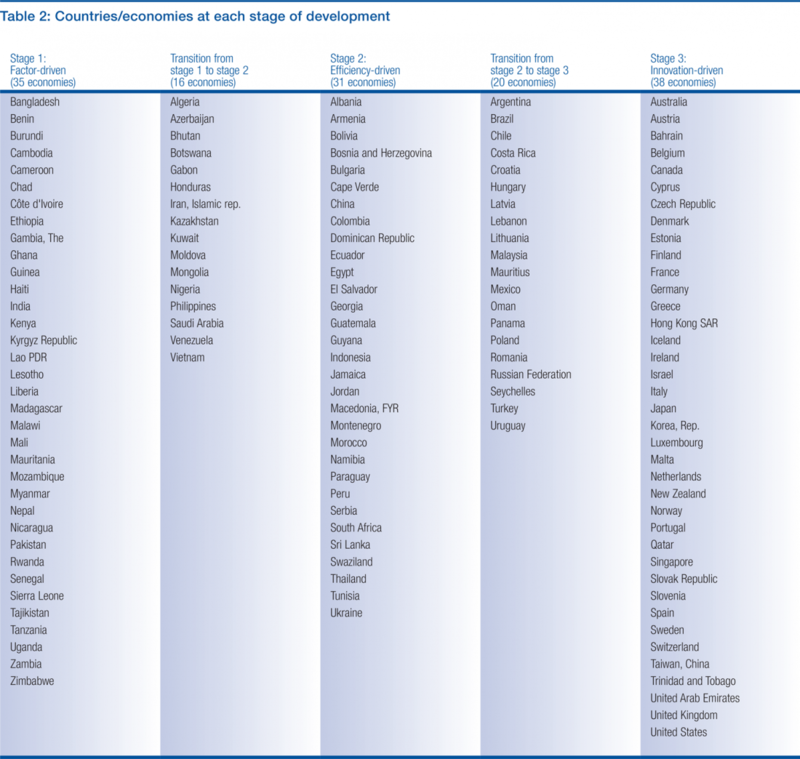 The classification of countries into stages of development is shown in Table 2. The computation of the GCI is based on successive aggregations of scores from the indicator level (i.e., the most disaggregated level) all the way up to the overall GCI score. Unless noted otherwise, we use an arithmetic mean to aggregate individual indicators within a category.e For the higher aggregation levels, we use the percentage shown next to each category. This percentage represents the category’s weight within its immediate parent category. Reported percentages are rounded to the nearest integer, but exact figures are used in the calculation of the GCI. For example, the score a country achieves in the 11th pillar accounts for 50 percent of this country’s score in the innovation and sophistication factors subindex, irrespective of the country’s stage of development. Similarly, the score achieved on the subpillar transport infrastructure accounts for 50 percent of the score of the infrastructure pillar. Unlike the case for the lower levels of aggregation, the weight put on each of the three subindexes (basic requirements, efficiency enhancers, and innovation and sophistication factors) is not fixed. Instead, it depends on each country’s stage of development, as discussed in the chapter.f For instance, in the case of Burundi—a country in the first stage of development—the score in the basic requirements subindex accounts for 60 percent of its overall GCI score, while it represents just 20 percent of the overall GCI score of Sweden, a country in the third stage of development. For countries in transition between stages, the weighting applied to each subindex is reported in the corresponding profile at the end of this volume. For instance, in the case of Turkey, currently in transition from stage 2 to stage 3, the weight on each subindex is 36.3 percent, 50 percent, and 13.7 percent, respectively, as reported in the country profile on page <?>. Indicators that are not derived from the Executive Opinion Survey (the Survey) are identified by an asterisk (*) in the following list. The Technical Notes and Sources section at the end of the Report provides detailed information about each of these indicators. To make the aggregation possible, the indicators are converted to a 1-to-7 scale in order to align them with the Survey results. We apply a min-max transformation, which preserves the order of, and the relative distance between, country scores. Indicators that are followed by the designation “½” enter the GCI in two different pillars. In order to avoid double counting, we assign a half-weight to each instance. a World Economic Forum 2014.
b Probably the most famous theory of stages of development was developed by the American historian W. W. Rostow in the 1960s (see Rostow 1960). Here we adapt Michael Porter’s theory of stages (see Porter 1990). See Chapter 1.1 of The Global Competitiveness Report 2007–2008 for a complete description of how we have adapted Michael Porter’s theory for the present application (Sala-i-Martín et al. 2007). c In order to capture the resource intensity of the economy, we use as a proxy the exports of mineral products as a share of overall exports according to the sector classification developed by the International Trade Centre in their Trade Performance Index. In addition to crude oil and gas, this category also contains all metal ores and other minerals as well as petroleum products, liquefied gas, coal, and precious stones. The data used cover the years 2010 through 2014. Further information on these data can be found at http://www.intracen.org/menus/countries.htm All countries with more than 70 percent of their exports made up of mineral products are considered to be to some extent factor driven. The stage of development for these countries is adjusted downward smoothly depending on the exact primary export share. The higher the minerals export share, the stronger the adjustment and the closer the country will move to stage 1. For example, a country that exports 95 percent of mineral exports and that, based on the income criteria, would be in stage 3 will be in transition between stages 1 and 2. The income and primary exports criteria are weighted identically. Stages of development are dictated solely by income for countries that export less than 70 percent minerals. Countries that export only primary products would automatically fall into the factor-driven stage (stage 1). d In practice, this applies to countries where the GDP per capita at current market prices has, for the past five years, been above an average of that of economies at the technology frontier. Countries at the technology frontier are the 10 countries with the highest per capita patenting activity according, to Patent Cooperation Treaty data. f As described above, the weights are as specified in Table 1 of this appendix. Refer to individual country/economy profiles at the end of this Report for the exact weights used in the computation of each economy’s GCI score. i “N/Appl.” is used for economies where there is no regular train service or where the network covers only a negligible portion of the territory. Assessment of the existence of a network was conducted by the World Economic Forum based on various sources. j In order to capture the idea that both high inflation and deflation are detrimental, inflation enters the model in a U-shaped manner as follows: for values of inflation between 0.5 and 2.9 percent, a country receives the highest possible score of 7. Outside this range, scores decrease linearly as they move away from these values. k The impact of malaria, tuberculosis, and HIV/AIDS on competitiveness depends not only on their respective incidence rates but also on how costly they are for business. Therefore, in order to estimate the impact of each of the three diseases, we combine its incidence rate with the Survey question on its perceived cost to businesses. To combine these data we first take the ratio of each country’s disease incidence rate relative to the highest incidence rate in the whole sample. The inverse of this ratio is then multiplied by each country’s score on the related Survey question. This product is then normalized to a 1-to-7 scale. Note that countries with zero reported incidence receive a 7, regardless of their scores on the related Survey question. In the case of malaria, countries receive a 7 if the World Health Organization (WHO) has classified them as malaria-free countries or included them in the supplementary list of areas where malaria has never existed or has disappeared without specific measures. l The competition subpillar is the weighted average of two components: domestic competition and foreign competition. In both components, the included indicators provide an indication of the extent to which competition is distorted. The relative importance of these distortions depends on the relative size of domestic versus foreign competition. This interaction between the domestic market and the foreign market is captured by the way we determine the weights of the two components. Domestic competition is the sum of consumption (C), investment (I), government spending (G), and exports (X), while foreign competition is equal to imports (M). Thus we assign a weight of (C + I + G + X)/(C + I + G + X + M) to domestic competition and a weight of M/(C + I + G + X + M) to foreign competition. m Indicators 6.06 and 6.07 combine to form one single indicator. n For indicator 6.14, imports as a percentage of GDP, we first apply a log-transformation and then a min-max transformation. o The size of the domestic market is constructed by taking the natural log of the sum of the gross domestic product valued at purchased power parity (PPP) (indicator 10.03) plus the total value (PPP estimates) of imports of goods and services (indicator 6.14), minus the total value (PPP estimates) of exports of goods and services (indicator 10.04). Data are then normalized on a 1-to-7 scale. PPP estimates of imports and exports are obtained by taking the product of exports as a percentage of GDP and GDP valued at PPP. p The size of the foreign market is estimated as the natural log of the total value (PPP estimates) of exports of goods and services, normalized on a 1-to-7 scale. PPP estimates of exports are obtained by taking the product of exports as a percentage of GDP (indicator 10.04) and GDP valued at PPP (10.03).